Neon AND textured? Of course I needed to try that! For this mani I created a gradient effect with 269 (pink) and 274 (yellow), both from the Neon Sand Effect line by Sophin. 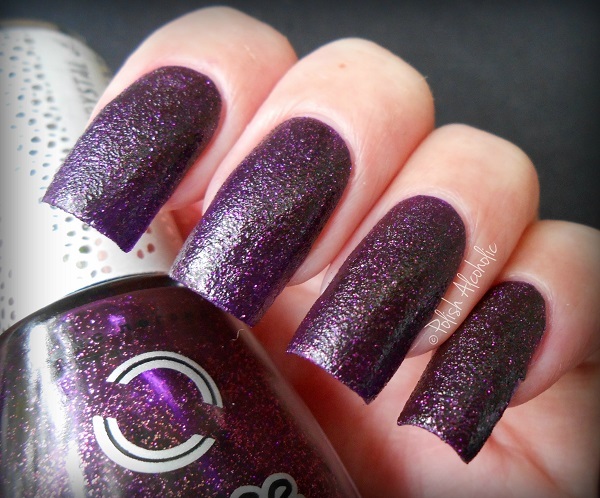 This brand recently launched at Hypnotic Polish and is definitely worth checking out. There’s a wide range of colors and finishes available for a reasonable price. These polishes do not need a white base to get that bright neon effect. I used a make up sponge to apply the colors over just one coat of base coat. I used black stamping polish by Mundo De Unas and MoYou ProXl plate 04 for the butterfly wings. Have a fabulous weekend! Here’s a textured polish for you today. This is Sand!Which? by Dance Legend: I applied two coats of Sand!Which? and stamped over it with No Place Like Chrome by Essie and MoYou Pro XL plate 04. And no top coat to enjoy the textured finish 🙂 Are you over textured polishes yet? I still like them, not as much as when the trend began but I think they’re still amazing. Today I have a textured polish to show you. 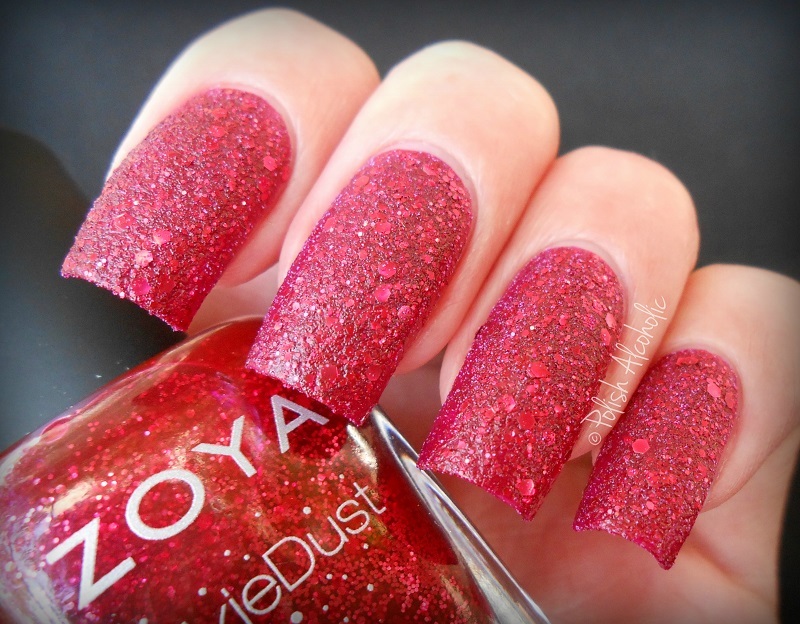 Here’s Arianna from Zoya‘s PixieDust Collection: For some reason my photo’s made it look like the polish hasn’t dried completely, while it actually is thoroughly dry. Anyhow, what a lovely color! I think this is slightly less textured than the other two pixies from last years Fall release. This is three thin coats with no top coat. You probably all know by now that my fave colors are red, purple, pink and blue. 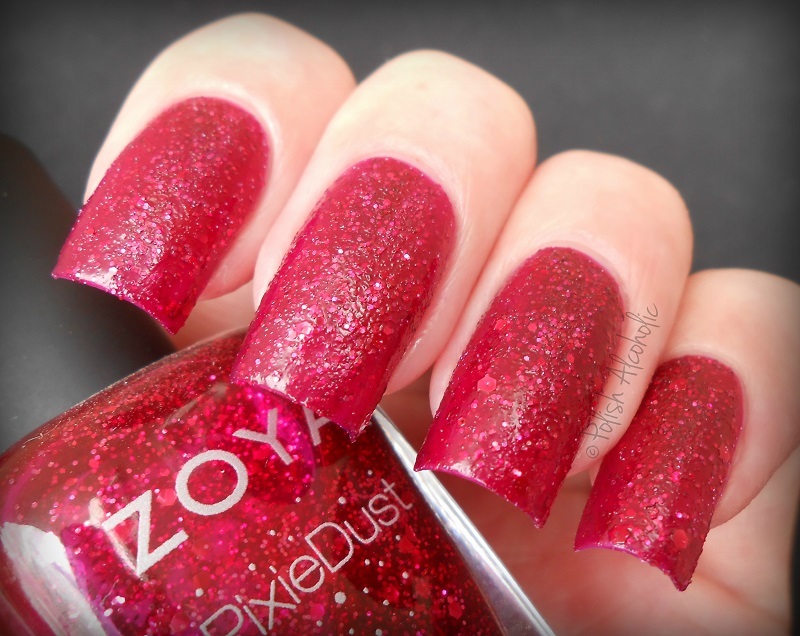 So when I saw photo’s of the three new PixieDust polishes by Zoya I just needed to have them. The formula is great and goes on smoothly despite the bigger glitter particles. Lovely! I can hear you thinking… where are the other two, Noir and Arianna? Well, funny not so funny story… I swatched all three and uploaded the pics from my camera the day after. And guess what? I hate how the photo’s of the other two turned out. Just.. arghhh I can’t even explain it. So yes, I’ll make sure to take some proper pics when I wear them again. To all my friends who are celebrating Halloween: Have a blast! I’ve found a gorgeous polish that would be especially perfect for Fall. Amethyst from the Sahara Crystal Collection by Dance Legend is such a gorgeous color! This textured polish is packed with lots of fine magenta glitter/shimmer which makes it very interesting to stare at all day 😀 It’s very pigmented. The formula is good. I used two coats for these photo’s. ANNY recently added 3 new textured polishes to their Desert Glam Collection. The initial collection was released back in May last year. That collection features six textured polishes, all in mini size. Along with these three new shades they also re-released She’s Amazing (a personal favorite of mine), Rock Your Nails and After Dinner Show, all full sized! Huray! Let’s take a closer look at these three beauties. All swatches show tow coats with no top coat. The pictures are -as usual- taken in in natural daylight, meaning outdoors. Get You Kicks is a gorgeous magenta pink base packed with magenta and silver colored glitter and bigger silver glitter. Highway To Heaven is a blue hue packed with blue and silver glitter. American Dream is a pale pink hue packed glitter in gold, pink and silver. ANNY nail polishes are exclusively available at Douglas stores (€ 9,95, 15 ml). More textured polishes? Yes, please! I fell in love with the color of Frosted Purple by Gosh. It’s a somewhat grey-isch purple, totally gorgeous. The formula is great. This is two coats, no top coat 🙂 Are you over the textured trend yet?